Today, Nick and I decided to take a stroll together and enjoy the beautiful weather we’ve been having. At first, we thought we’d take a little street hike up to Twin Peaks, but then I remembered we needed to go to Safeway, which is about a mile and half up the road. We figured it would be a nice time to walk up there, and if we kept our shopping light, we wouldn’t have too much to carry back home. We walked up to Safeway, did some shopping, and were going to check out when Nick said he was hungry, so we looked for something to take with us to eat on the way home. First we thought of a sandwich or wrap, because it’s easy to eat while walking, but since we’re trying to eat less grains, we decided to get a roast chicken, and to find a place to sit for a while to eat some, and just a relax a bit before heading back. I remembered that on our way over, there were a few people walking out from what looked like path, just up the street from the shopping center. 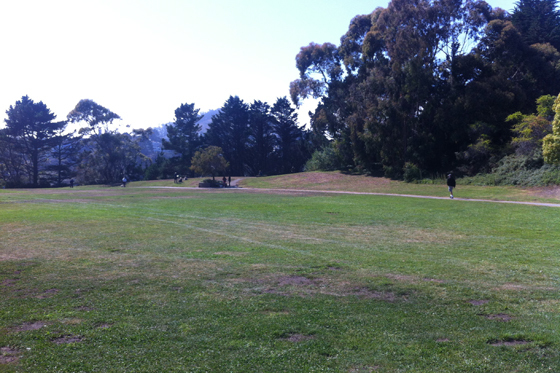 We figured we’d check it out – it might be a spot people go to sit and have lunch! What we found amazed us. 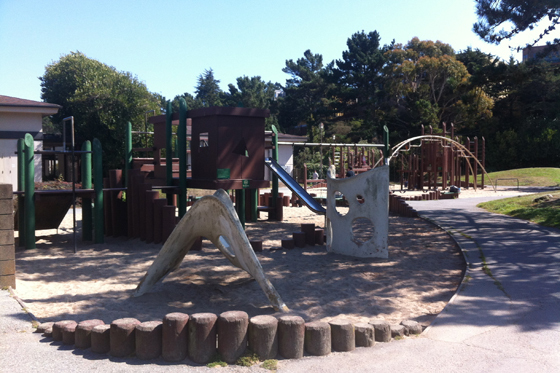 Tucked away behind the shopping center is Christopher Playground. 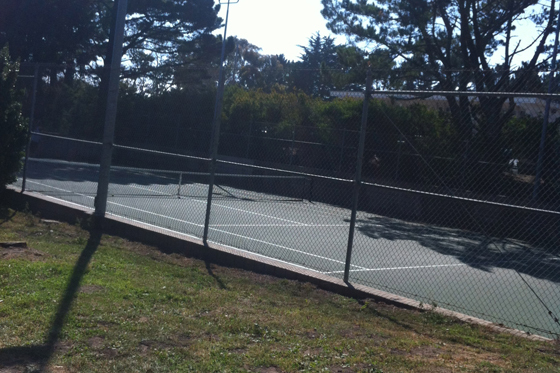 As we walked down the little path, we saw a tennis court. Neat! 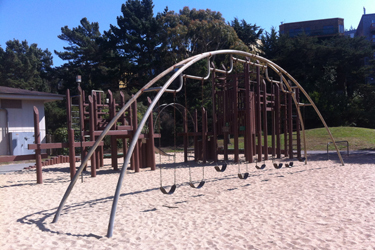 We expected that to be the end of this tiny “playground.” How cute. 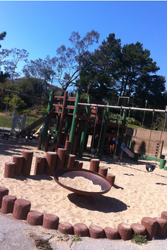 But we walked a little further down, and there was actually a PLAYGROUND! Two of them! One for big kids, and one for smaller kids! So cool! And they look like they’re in great shape and they’re being kept up. 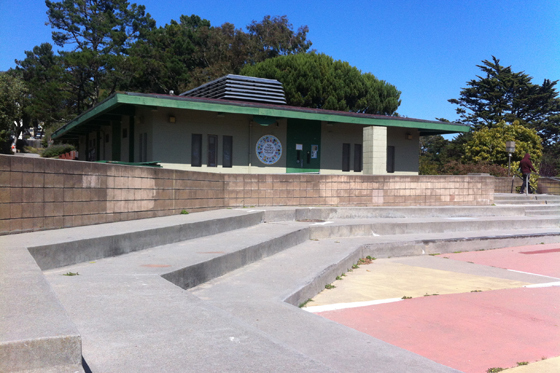 There was also a small amphitheater type space, and I realized there’s a little preschool right on the grounds. 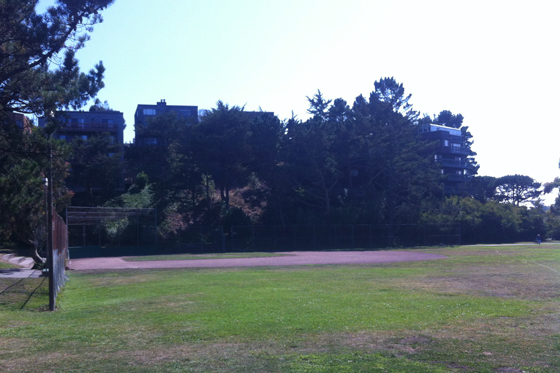 … and a field with a walking/jogging path! This place is fantastic! I can’t believe I’ve lived just down the road almost all my life and I never knew this place existed. When we were kids, my grandpa took us to plenty of different parks and places for adventures, but for some reason we never came to this one. I’m so glad Nick and I decided to walk to the store today – we pass this place so many times in a week, but have never had an excuse to explore. 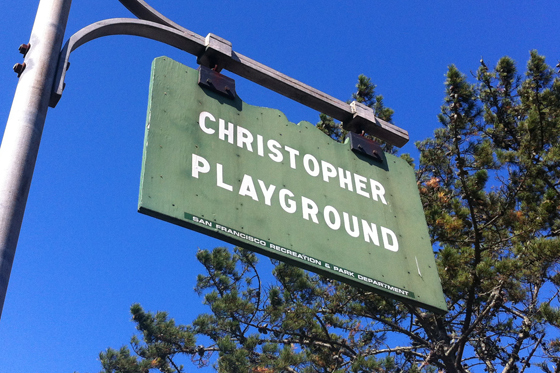 Because Christopher Playground really is tucked away, it’s pretty quiet, but it’s actually also right next to the police academy – and we saw several cadets walking back and forth from the academy to the shopping center, through the park – so it seems safe even though it’s somewhat secluded. What a rare find! I can’t wait to come back.